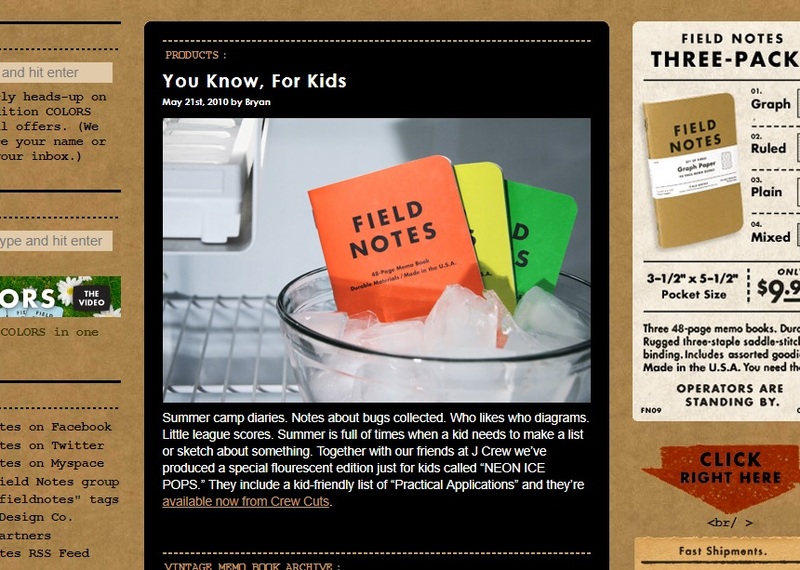 It’s seems like an odd marketing choice for Field Notes to create a special edition “just for kids,” but that’s exactly what they did with the Neon Ice Pop edition in early 2010. Rather than the standard Kraft brown cover stock, Field Notes and Crewcuts (J. Crew’s children’s line) partnered together to give the children something a little brighter in the form of fluorescence; each 3-pack contains one green, one yellow, and one orange notebook. Inside each notebook there are 48-pages of 50# white paper with a bright “Summer Sky” blue graph ruling, and a kid-friendly “Practical Applications” list that includes some uninspired items such as “Chores,” “Addresses,” and “Wish Lists.” Besides that, these notebooks aren’t any different from your typical pack of Field Notes. If you’re looking for a bright set of Field Notes or just looking to collect one of their older editions, then you’re in luck. Though these Neon Ice Pops have been out of print for some time, they tend to show up frequently in secondary markets (like eBay or Facebook). And, often, I’ve seen them available for little more than J. Crew’s original $14.50 price tag. 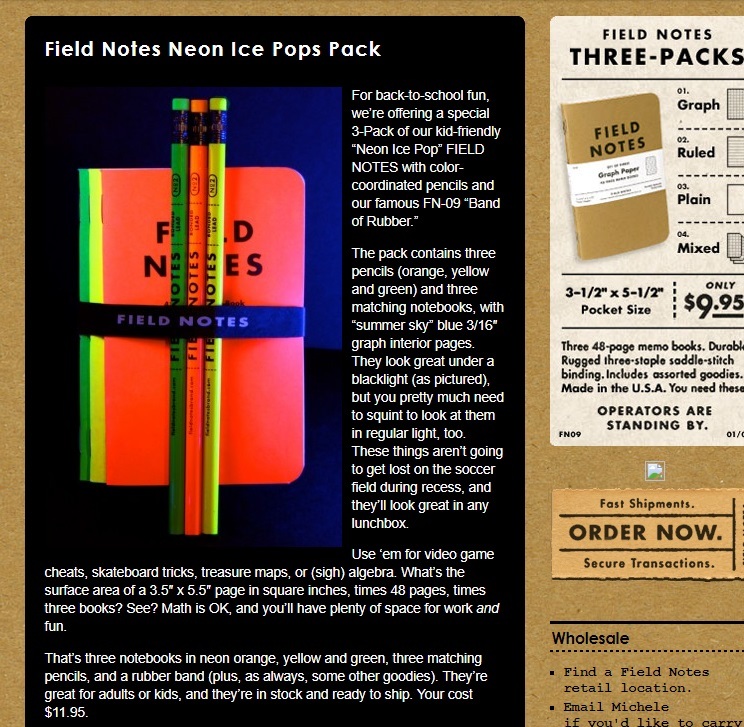 The Neon Ice Pop edition isn’t among the best that Field Notes has created, but it’s hard not to like them anyway. They are simple and fun… even for an adult. 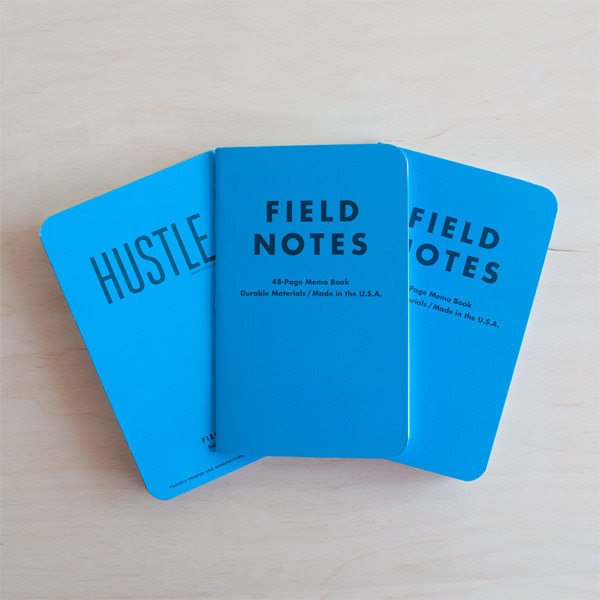 At some point, late in 2010, Field Notes also made this edition available on their website for $11.95, and they also included a set of matching pencils! Is it the Neon Ice Pop Edition or the Neon Ice Pops Edition? Their website has used both – with and without an “s.” Well, according the the inside-back cover, on the very bottom, it should be the “Neon Ice Pop” edition. No S.
Every year, the halls of the XOXO Festival – an art and technology conference out of Portland, Oregon – have been complimented by an exclusive edition of Field Notes pocket-notebooks. 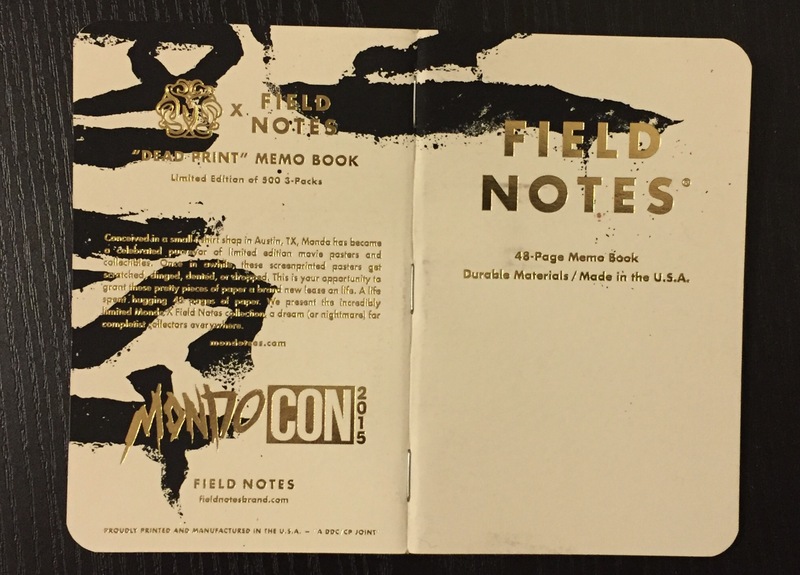 In 2015, the conference engaged artist Brendan Monroe to create artwork that adorned the notebooks’ covers, which was a very good decision (it just so happens that the XOXO 2015 Field Notes are one of my favorite editions). So for the XOXO 2016 notebooks, I was happy to see that another artist was again involved, and the resulting designs can justly be described as an explosion of orange and pink. This marbled/tie-dye cover-art was created by Mark Weaver, a designer and illustrator based out of New York, and from what I’ve seen on his website and Flickr account, he has an artistic style that might be described as ‘funky modern.’ For the XOXO 2016 notebooks, he created artwork that is bright, trippy, eye-catching, and generally just pretty cool. Inside the books, 60# white paper is ruled with bright-orange grid-lines, a color that I’ve found looks particularly good behind bright-blue ink. This edition is another win for XOXO, but I hate to talk these notebooks up too much, as they are difficult to find. Attendees of the XOXO conference were easily able to get a 3-pack, but I was able to get mine a few weeks later when extras were made available on the Field Notes website. They sold out quickly, however, and the best bet on finding a set now is through eBay where they will likely be overpriced (though it looks like they might still have some available at their Chicago home base). So, good luck to you if you’re on the hunt for this Field Notes edition. They are, after all, probably one of the better things to come out of 2016. 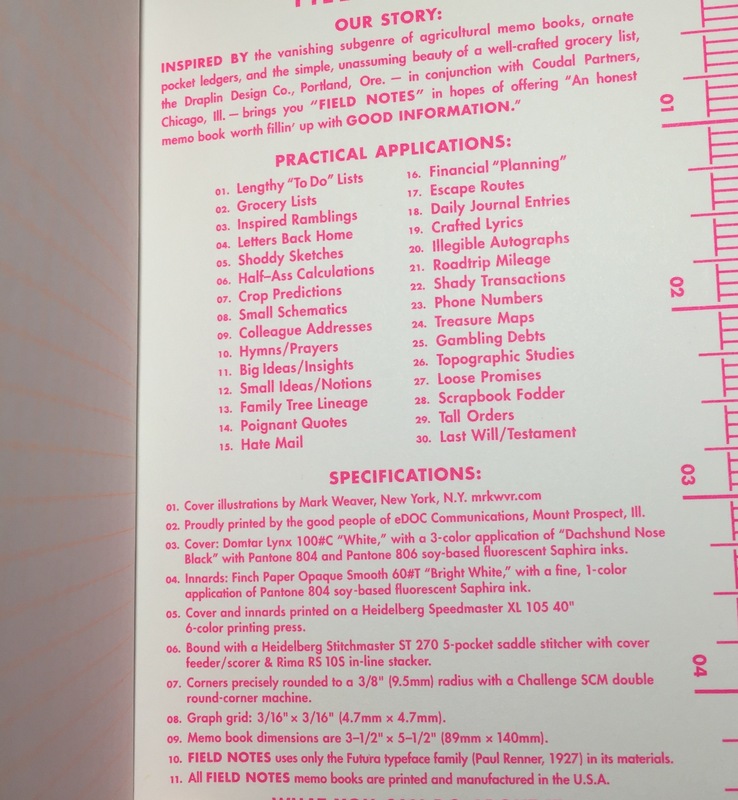 The “Practical Application” list in the back cover is, unfortunately, just the standard list used in the basic kraft notebooks, but at least it was printed in bright pink. 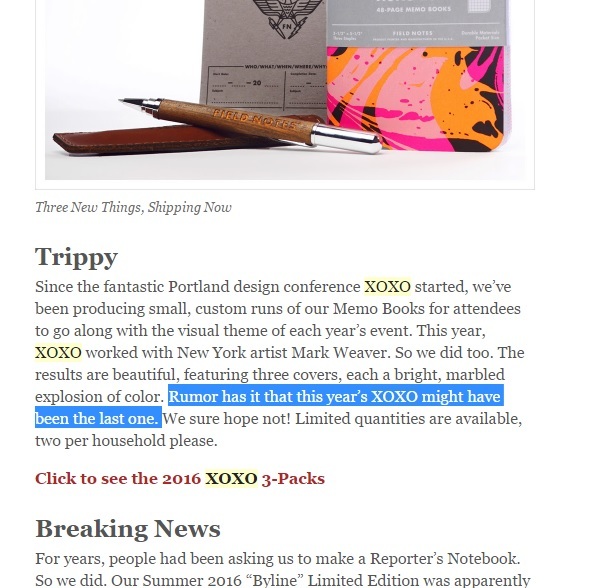 I’d suggest keeping an eye out for next year’s XOXO Field Notes, but an e-mail from Field Notes mentioned that the 2016 XOXO Festival might have been the last one. We’ll have to wait and see, I guess. 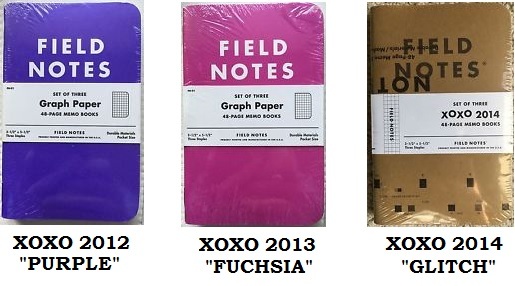 For the first year of the conference in 2012, the XOXO special edition Field Notes had solid purple covers. 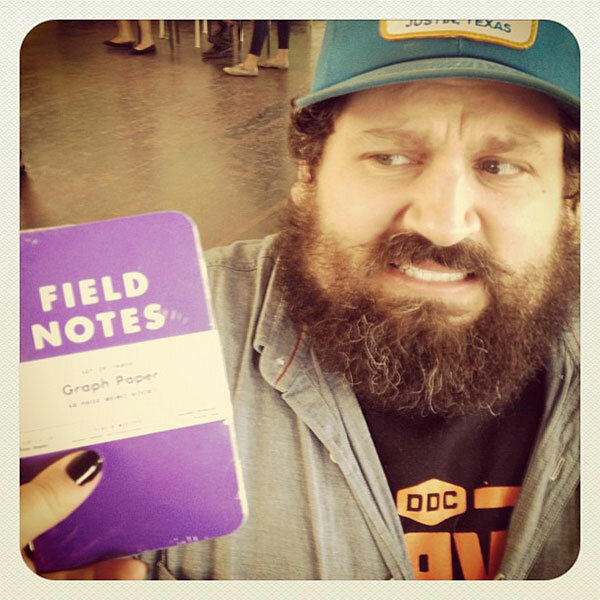 Ironically, Aaron Draplin (the creator of Field Notes) hates the color purple. He’s said, “I don’t use purple in anything. It’s the color of royalty. It’s the color of sweaters on cat people. Just don’t do it.” Maybe that explains this picture. “Posters are delicate things,” writes Aaron Draplin. So what is a poster-maker to do when misprinted, damaged, and test prints begin to pile up in the workshop? 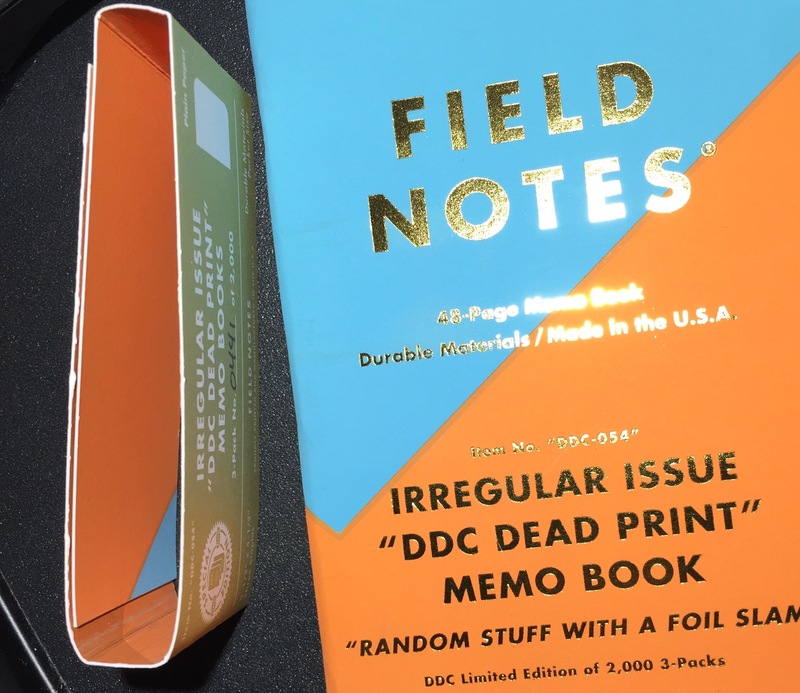 For Draplin, the creator of Field Notes, the answer couldn’t have been too difficult: use these ‘dead prints’ to make pocket-sized memo books. 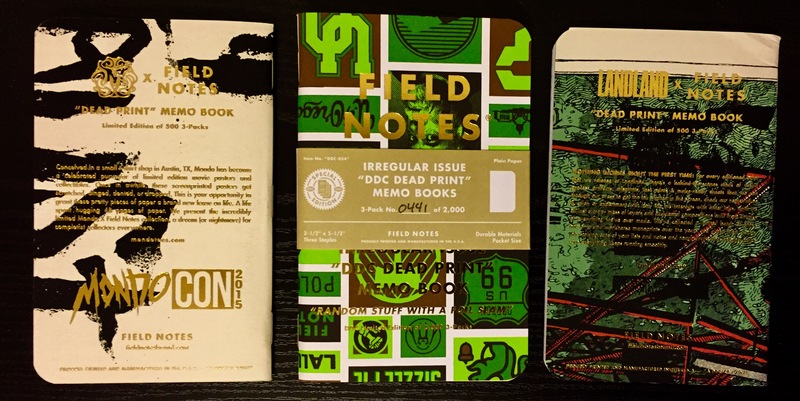 So, in October of 2015, limited edition “Dead Print Field Notes” were made for three poster-producing companies: Draplin Design Co., Mondo, and Landland. 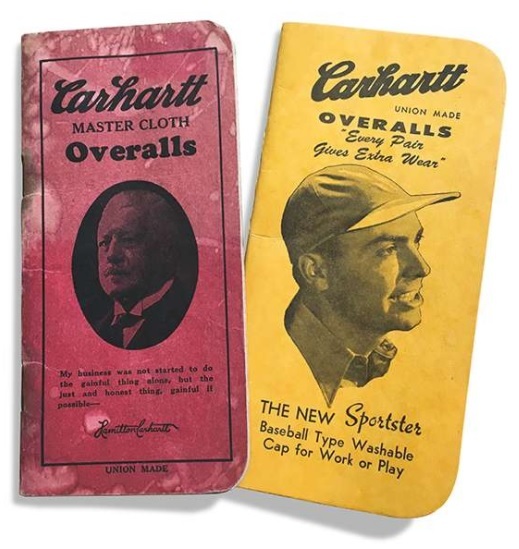 Between all three companies, only 3,000 3-packs were made, and with images of these notebooks sporadically popping up on Instagram and Twitter, these Dead Print Field Notes became somewhat of a craze. Although the notebooks contain basic 50# blank paper, the unique covers, made from assorted posters, spurred on the collectors. Getting my hands on all three was no easy task. I’ve seen sealed 3-packs occasionally sell for over a hundred dollars on eBay (much, much more than I’m willing to spend), but with a bit of patience, I found them all individually for reasonable prices. The DDC Dead Prints were initially only sold at a pop-up shop run by Aaron Draplin in Portland, but eventually a handful were sold through his website. There I was able to grab a couple 3-packs before they sold out. Similarly, the LandLand Dead Prints were briefly available on their website, but many of the shipments were lost in the mail, including mine. Fortunately, the good folks at LandLand were able to ship out replacements a couple months later. The Mondo Dead Prints were trickier. They were initially distributed only at MondoCon, the company’s convention, but some extras were sold online. These became sold out lightning-fast, well before I was able to add a pack to the shopping cart. 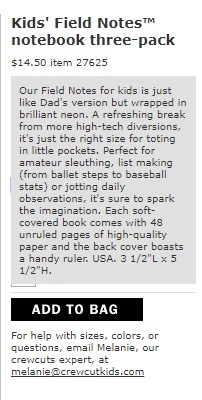 But, after months of scouring eBay, I eventually found a single Mondo notebook for a relatively low price (never mind that it’s mostly just a white notebook). After some use, I wouldn’t hesitate to say that these Dead Print Field Notes are one of my favorite editions. Aside from the special cover-paper, there’s no difference between this and a standard Field Notes notebook. However, with their wild designs and the gold-foil used for the cover text, I’ve received more comments/compliments on these notebooks than I have while carrying around any other Field Notes edition. It’s really a shame that these notebooks are so rare, but maybe, if we’re lucky, Draplin, LandLand, and Mondo will continue to damage enough posters in order to justify another run. 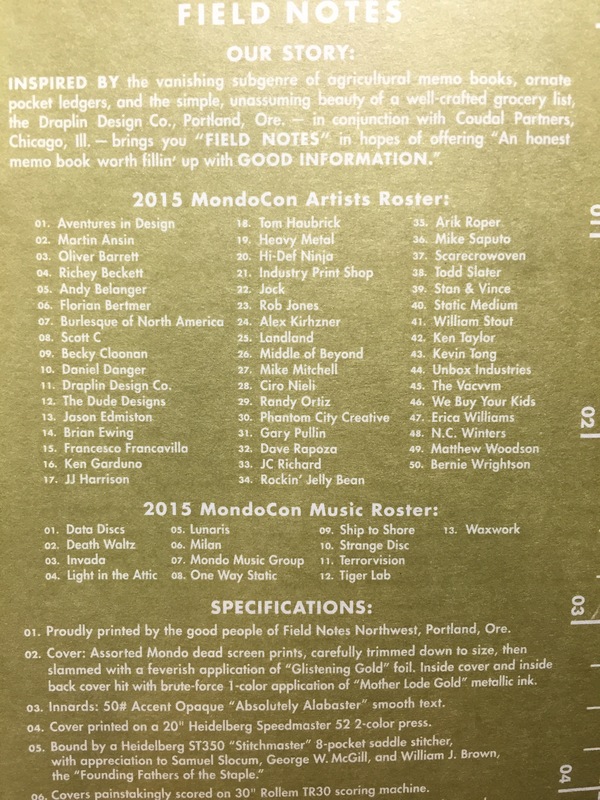 The Mondo Dead Prints have no “Practical Applications” list, but a musician/artist roster for their convention instead. 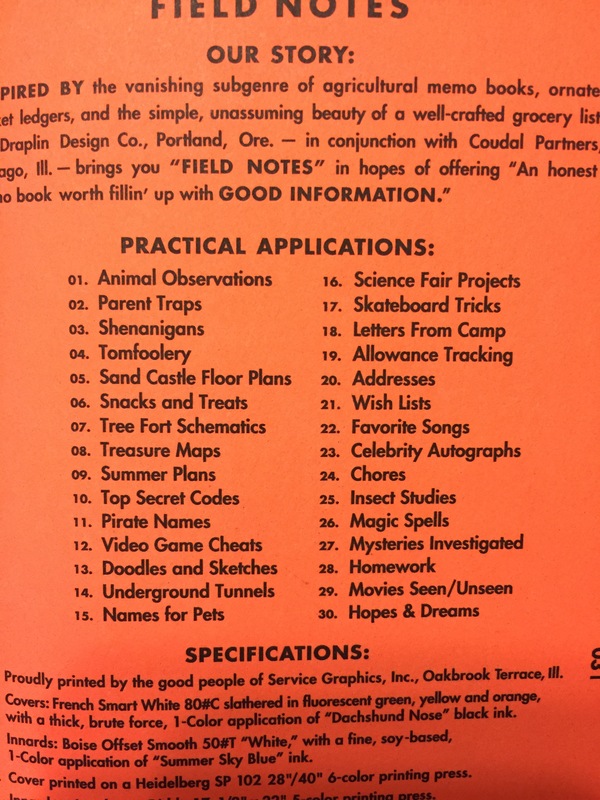 Both the DDC and Landland books, however, do have “Practical Applications” lists. My favorites: “02. Thick Lines Tinkerings” (DDC) and “16. Hashtag Plans” (LandLand). Even the belly-bands seem to be made of inside-out posters. And speaking of Aaron Draplin, I wrote a review of his book. I liked it. It’s worth checking out if you like those DDC Dead Print designs.